These two lectures by Jacques Derrida, "Foreigner Question" and "Step of Hospitality/No Hospitality," derive from a series of seminars on "hospitality" conducted by Derrida in Paris, January 1996. His seminars, in France and in America, have become something of an institution over the years, the place where he presents the ongoing evolution of his thought in a remarkable combination of thoroughly mapped-out positions, sketches of new material, and exchanges with students and interlocutors. As has become a pattern in Derrida's recent work, the form of this presentation is a self-conscious enactment of its content. The book consists of two texts on facing pages. 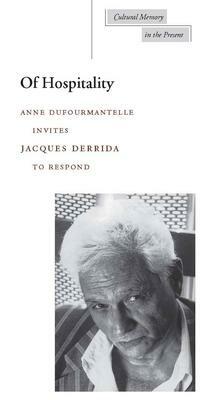 "Invitation" by Anne Dufourmantelle appears on the left (an invitation that of course originates in a response), clarifying and inflecting Derrida's "response" on the right. The interaction between them not only enacts the "hospitality" under discussion, but preserves something of the rhythms of teaching. The volume also characteristically combines careful readings of canonical texts and philosophical topics with attention to the most salient events in the contemporary world, using "hospitality" as a means of rethinking a range of political and ethical situations. "Hospitality" is viewed as a question of what arrives at the borders, in the initial surprise of contact with an other, a stranger, a foreigner. For example, Antigone is revisited in light of the question of impossible mourning; Oedipus at Colonus is read via concerns that also apply to teletechnology; the trial of Socrates is brought into conjunction with the televised funeral of Francois Mitterrand. Translator's note 1. Invitation Anne Dufourmantelle 2. Foreigner question Jacques Derrida 3. Step of hospitality/no hospitality Jacques Derrida Notes. Jacques Derrida was Director of Studies at the Ecole des Hautes Etudes en Sciences Sociales, Paris, and Professor of Humanities at the University of California, Irvine. Stanford has published eight of his books, most recently a joint publication of The Instant of My Death (Maurice Blanchot) and Demeure: Fiction and Testimony (Derrida). Anne Dufourmantelle is a philosopher and psychoanalyst in Paris and the author of La vocation prophetique de la philosophie.